Dinosaurs, Puppets and Maritime Adventures this Half Term! With half-term fast approaching, two professional children’s theatre companies are heading to Dorset to tour with Artsreach, the counties rural arts charity. With five live performances in five different villages, plus the opportunity to step aboard the Story Boat in two of Dorset’s libraries, what better way to keep children entertained during the school holidays?! Combining their unique style of puppetry, live music and storytelling, Tall Tree Theatre return following their acclaimed tour of ‘Shackleton’ to share a tale of wild weather, wild birds and wild ambitions and a young girl called Lily whose dreams are just out of reach. When a very special bird flies in from across the water, Lily begins to question everything, and is given the nudge she needs to truly stretch her wings. Lily & the Albatross is a heartfelt tale about achieving the unachievable and never letting go of your childhood dreams. Scotland’s leading touring puppet companies, Clydebuilt Puppet Theatre, head to Dorset for their Artsreach debut. Join the 'Dinosaur Detectives' on a fascinating journey delving in to the stories of the first fossil finds of Mary Anning, William Buckland and Gideon Mantell, finds which changed the face of history. Featuring puppets, shadow play and projections, Dinosaur Detectives is packed with all the fascination, fun and conflict that surrounds the search for dinosaurs, and children can get hands-on at the fossil table after the show! 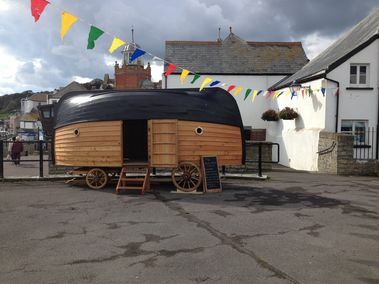 Venture inside the magical enchanting space of the Story Boat when it arrives in Gillingham Library on Tue 23 Oct, and Weymouth Library on Thur 25 Oct. This miniature world of the sea is made from an upturned Dorset Fishing Boat from 1923. Hear the story of the motherboat ‘Vera’ and tales of the mysterious memory objects housed inside her, then try your hand at boatbuilding with the riveting of a miniature Story Boat plank. Places are limited so booking is advised.